The Independent Midwife offers practical advice for those wishing to set up an independent practice or partnership. 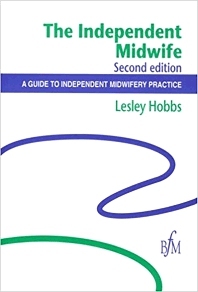 Originally published in 1993, the book has proved to be an invaluable source of advice and information for any midwife interested in continuity of care and in autonomous practice. The new edition includes a brand new chapter on the subject of insurance, which has altered dramatically since the first book was produced. Setting the scene; Legal issues; Professional issues; Money matters; Marketing yourself; Supervision; Matters of Practice; Smoothing the way; Expanding the Practice; Appendices; Index. During her midwifery career, Lesley has been both an independent and an NHS midwife. She has been secretary of the Independent Midwives Association and founder of the Wessex Maternity Centre and now works as co-ordinator of a midwife-led unit, one of the first to offer a full caseloading and community service to a population of around 600 women a year.